Liane Balaban in a black & white publicity still for New Waterford Girl. original in the Northernstars Collection. The parallel story lines of Mooney and Lou form the nucleus of New Waterford Girl’s funny, bittersweet and thoroughly original screenplay by newcomer Tricia Fish. Set in the small, east–coast town of her youth, Fish has an authentic feel for the place and in Quebec–born director Allan Moyle, she found her soul mate. His handling of youth–oriented material (Pump Up the Volume and Empire Records) is well suited to Fish’s small–town, coming–of–age story. Mooney, played to perfection by Liane Balaban, lives up to her name and is indeed glum and moody. She hates her life, her town, her parents, the loser boys that surround her. Her only solace is a sympathetic high school teacher, nicely underplayed by former “brat packer” Andrew McCarthy, who encourages her to enrole in an arts school in New York. Into this prison of small–town values – where “bad” girls are sent away to deliver their “mistakes” to avoid the embarrassment of an unwanted pregnancy – comes Lou (Tara Spencer–Nairn), a girl of Mooney’s age but as different form the moody Mooney as night is to day. Lou chose to come to New Waterford. It’s Lou’s attempts to gain acceptance and Mooney’s desperate need to get out of town that drives the plot of New Waterford Girl. 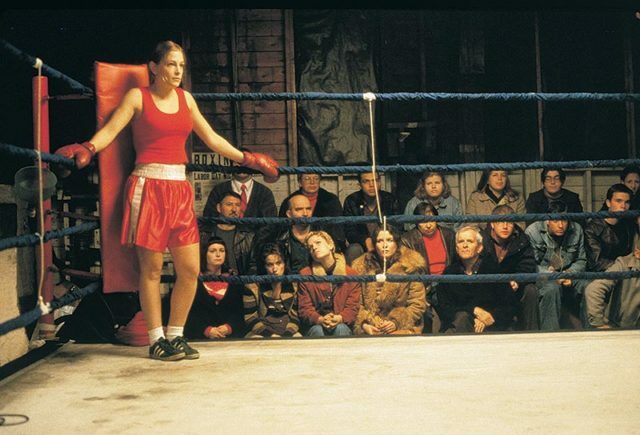 Lou is at first picked on by the town’s tough girls, but when it is discovered that she has inherited her father’s knockout punch, the town toughs engage her to punch out one of their boyfriends who is two–timing. Lou asks, “If I do this, will I be a New Waterford girl?” “No,” they say with dumbfounded surprise. “You weren’t born here.” But Lou does deck the guy anyway and her road to acceptance has begun. The relationship between Mooney and Lou is the core of the film and there is a great deal of chemistry between them. Balaban has been singled out for her fresh performance in a role that seems written for her (think of Shelia MacCarthy’s star turn in Patricia Rozema’s I’ve Heard the Mermaids Singing and you get the idea), but it’s Spencer–Nairn who carries the film and virtually steals every scene she’s in from her co–star. Whereas Balaban plays Mooney as a one–note wonder (her head cocked endearingly to one side, as if expecting the worst, with a winning smile from an elfin face the camera loves), Spencer–Nairn gives the necessary life and energy to the proceedings. Lou’s is the more original character and the film’s climatic scene is the fight between her and the boxer from Sidney. After a slow start, Lou flattens the guy with a wicked right hook. She finally becomes a New Waterford girl, and Mooney’s scheme to fool her parents (nicely played with out–of–touch charm by veterans Nicholas Campbell and Mary Walsh) into thinking she is pregnant succeeds with the help of her high school teacher. She gets to leave, if reluctantly, for New York while Lou happily gets to stay. Allan Moyle brings over 30 years of experience to what, for him, is essentially a movie for hire. It’s Fish’s film, there is no doubt about that, but Moyle’s deft handling of the material holds things together and he doesn’t stoop to the current low ebb in teen comedies. This is no American Pie or Road Trip. The most gross–out thing is morning sickness. Moyle recognizes the subtleties needed to make New Waterford Girl work and he draws out the best from his two inexperienced leads. His choice and use of music is particularly effective. From the opening “Dragging the Line” by Tommy James, to the Canadian–heavy sound track, which includes 1970s hits from A Foot in Cold Water, April Wine and The Stampeders. 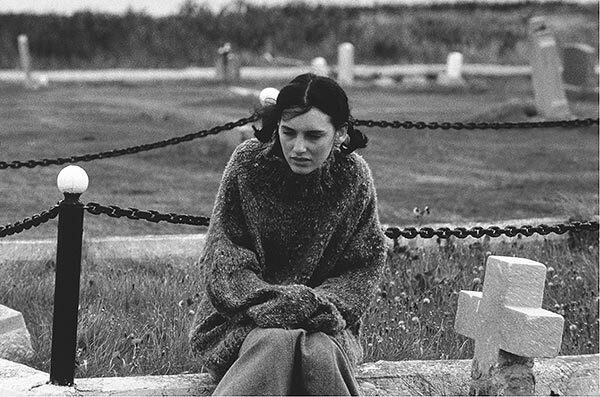 New Waterford Girl is a rarity in Canadian cinema, artistically and commercially successful at the same time. It’s an audience pleaser in the way that so many Canadian features aren’t. The only comparison in recent years is that other hit from down east, Mort Ransen’s Margaret’s Museum. It would seem that despite the film’s obvious Canadian trappings, a good story, well told and well acted will always draw a crowd, and New Waterford Girl is no exception to that rule. This review was originally published in Issue 30 (Winter 2001) of Take One magazine. Northernstars.ca acquired the archives of Take One in 2007. 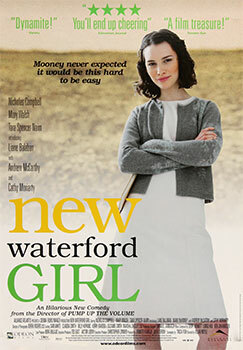 The poster for New Waterford Girl was scanned from an original in the Northernstars Collection.